"The best space film ever done." When James Cameron – a guy who knows a thing or two about making epic space films – says something that refulgent about a project, expectations are suitably raised to the stratosphere. And while I do my best to quash any advanced knowledge of a movie – both good and bad – before the lights dim on its screening, attempting to dismiss something of that heft – from someone of that stature – is futile. Now couple Cameron's lofty praise with the triumvirate of illustrious talent involved in said project: Oscar winners George Clooney and Sandra Bullock, directed by the man who made Harry Potter dangerous, Alfonso Cuarón. Can you really blame me for having through-the-roof expectations entering Gravity? So what happens when said expectations aren't met — even remotely? It's a disappointment level of astronomical proportions. 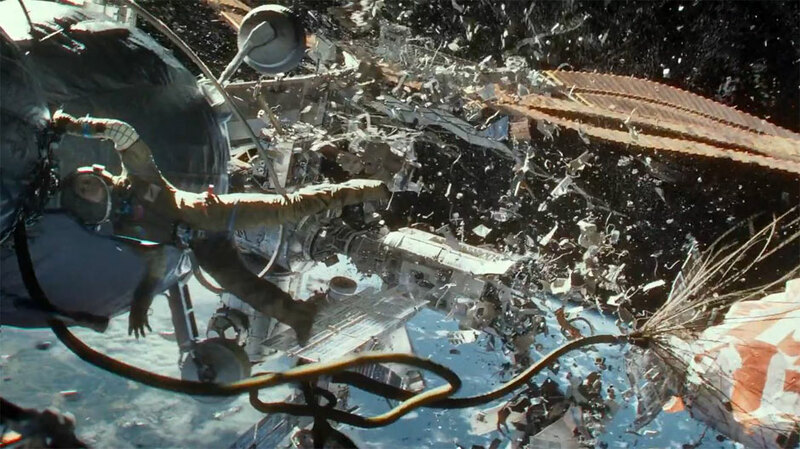 Floating right-to-left across the 3D, CGI-splattered screen in his NASA-issued, rocket-thruster'd La-Z-Boy, Clooney opens Cuarón's first picture since Children of Men as Matt, a grizzled astronaut orbiting the heavens with a manly-named medical engineer, Ryan (Bullock), two of the Space Shuttle Explorer's (the replica shuttle now parked in Houston) crew experiencing weightlessness some 220 miles above terra firma. With debris from a Russian satellite shredding everything to pieces, Ryan finds herself untethered in space, spinning like a gyroscope as Cuarón flips his camera around, and around, and around – and around – in first-person perspective. My recent ride onboard the Gravitron was less nauseating. (Spoiler alert) But the cataclysmic chain of events has just begun, the remaining two-thirds of Gravity consists of Ryan – minus Matt – desperately trying to get back home as every conceivable – belief-stretching – catastrophe occurs in the rather inhospitable environs of outer space. As Cuarón spells out in his intro: "Life in space is impossible". So is forming any emotional attachment to Gravity. Cuarón – teaming with son Jonas on the summarized-in-one-sentence screenplay – fails to generate the desire to give a crud whether anyone makes it out alive. There's an attempt to jam a tragic backstory onto Bullock's astronaut-newbie character, but rooting for someone to get back home to their dead daughter? What, to lay flowers on the girl's gravestone? Ryan's eventual "rebirth" is similarly unmoving, even with Steven Price's surging soundtrack imploring us to grasp the weightiness of her mission to go on. Clooney plays things as if he's still Up in the Air, delivering the "crammed-to-the-gills backpack" speech — waaay too cool for the dire circumstances. Bullock is yet another fish out of water, trying to keep it together as she bleeds oxygen, jumping from space station to space station to space station, hoping to hitch a ride on some magically-unscathed escape pod. In space, no one can hear you snicker. For all the celestial splendor on display, the film's lasting image has nothing to do with the cosmos — for someone who just turned 49, Sandra Bullock has some spectacular legs.